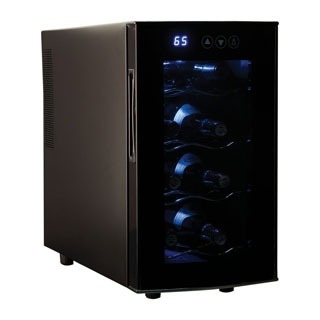 If you are looking for a small, compact wine cooler then take a look at some popular 8-bottle wine cooler refrigerators listed below. These compact wine storage units take up little space while providing proper storage conditions for your favorite wines. Since these small capacity wine refrigerators are moderately priced, they’re perfect for beginner wine connosieurs who want to keep a couple of bottle of their favourite wines at the right serving temperature, but they’re not yet ready for investing in a more sophisticated wine cabinet. Cheap wine coolers tend to vary in quality, so to make a well-informed buying decision and get real value for your money compare the following eight bottle wine coolers. Haier has several 8-bottle electric wine coolers designed for countertop placement. They are thermoelelctric units with black cabinet, tinted, insulated glass door with recessed handle. The interior lining is also black. Adjustable digital themostat and LCD display ensure simlpe use. Control buttons and temperature display are integrated in the top door frame. The switch for the interior lighting is also there. 4 chrome plated wire racks cradle the wine bottles. Price range: Haier HVTEC08ABS model: $100 – $120 ($12.5 – $15 per bottle). Read user reviews on the Haier HVUE08ABS wine cooler to find out more about its features and possible user complaints. A thermoelectric, silent appliance featuring an all-black cabinet design with see-through, smoked glass door and recessed handle. Temperature can be set between 44 – 64°F (7 -18°C) with touch buttons. Dispaly is red LED. 3 removable wire shelves hold 2-2 bottles (standard 750 ml), and you can place 2 more bottles on the bottom of the cabinet. This is a space-efficient stainless steel home wine cooler with convenient countertop size. The MCWC8DCT2 model comes with tinted glass door that has a curved stainless steel grip handle for easy opening. You can store 8 ordinary size bottles of wine on the 2 wavy chromed shelves. The control panel is integrated in the top frame of the door. You can set the unit to cool to a desired temperature between 44 – 66 ºF (8 -18 ºC) by pressing the Up and Down buttons next to the digital display. The LCD screen displays the actual temperature inside the unit. To set the desired cooling temperature keep pressing the Up/Down buttons until the display shows the temeprature you want the cooler to be set. The LCD screen will flash and show this temperature for a few seconds, then it’ll stop flashing and displays the actual temperature inside the cooler. Note that there might be a max. 2 degree temperature difference between what the readout indicates and the actual temperature. Temperature can be selected to be displayed either in ºF or in ºC with a button to the left of the display. There’s also a button to turn on or off the interior light. The manual recommends to place the cooler in a room with ambient temperature between 46 – 86ºF (8 – 30ºC) to ensure efficient cooling. This wine fridge was designed to be used inside a home and in a garage, or outdoors. One user have complained that after a copule of months of use the control buttons started to “stick”. Other user said that the cooler is not very user-friendly though she/he didn’ go into details why. Other customer had two units that broke down within a month. This is a thermoelectric fridge that is said to be silent and vibration-free, but some owners have complained on the high noise level. TIP: Read about the Pros & Cons of Thermoelectric Wine Refrigerators. TIP: Read an overview of Magic Chef wine coolers. 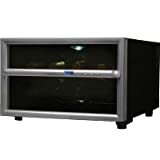 Find a selection and reviews of other countertop wine coolers. Read review of the Sunpentown WC-08 8-Bottle Wine Cooler and on the Emerson 8-Bottle Countertop Wine Cooler. 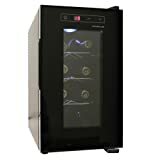 The Chambrer 8-bottle wine cooler tower, Model WC6030-197 is a dual-zone unit. TIP: See also more Reviews and Information on Various Wine Coolers.